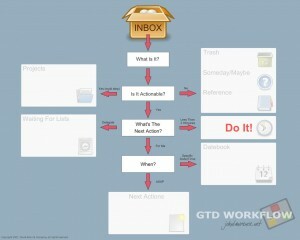 Getting Things Done- What Is Your Next Action? If you are taking too much time processing the items in your inbox, it may be a problem with how you are defining the next action for each one. More often than not, we do not clearly define the next action for items and as a result our projects either get delayed or come to a complete stop. All of us experience this at some point or another. One of the best things of the Getting Things Done is that it gets you to think more rigorously about your next actions on the front-end. While this might seem like a lot of work, the end result is that it actually makes your life easier. Getting Things Done encourages you to make quick and concise decisions on each next action instead of overthinking them. To be honest, most of us tend to either overthink or underthink the desired results of projects leaving our next actions undefined. One way to detect this is to look at your next action and ask yourself, “is this something that I can complete right now?” If not, what is the reason? In most cases, it is because there is something else that needs to be done first. You missed something because you did not define your next action properly. Let’s assume that your next project is to get your car serviced. Your initial next action might be ‘get car serviced’, which is short but unclear, and undoable unless your are currently standing in the auto service center. You need to work on it to make it into a more precise action, which might be ‘get the number of the service center,’ or ‘ask John where he gets his car serviced.’ In this case, the action identified was not actually the next action. This happens all the time. Even though the action you identified does not fully complete your project, it is part of the series of actions that you have to take to complete it. Now, if you look at your list of things to do, you may notice a lot of actions are steps to complete a project. Unfortunately, when these actions are not defined clearly enough, or fully thought out, you end with actions which are either left incomplete or do not actually lead to the results you desire. Surprisingly, all you need to do so solve this problem is to think things through properly. It may take a little more discipline, and you may have to go beyond the obvious, but it will help you to create a clearer path to completing your projects. Another problem with undefined next actions is that you end up with an incomplete series of steps. For instance, let’s take the car service example. Your project is getting your car serviced. and the first action in completing that task is to get the service center’s number. When you get home at the end of the day and begin to make phone calls. You bring up your list of phone calls and find out that you do not have the service center’s phone number. Now you have a next action that you can’t complete. If you thought through the project, you would have the number available, and the phone call can be made right then and there. By the end of your phone call, you have done something productive and made an appointment to get your car serviced. What next action can you take today to begin living your life on purpose? Comment here.